Fabrics or textiles have been used for many different purposes. Historically handwoven textiles have been used for personal attire and as tapestries for wall hanging, curtains, carpets, furnishings, furniture coverings, etc. Such furnishing Fabrics are crafted by many different techniques such as weaving, knitting, embroidery, stitching, sewing, crocheting, patch working, seaming, and lace making. Fabrics are adorned with dyes, colours, fabrics, yarns, fibres, threads, coins, metal pieces, glass beads and flats, bones, buttons, laces, leaves, flowers and feathers. The motifs used in fabric weaving and other craft-work, are rudimentary and very ancient, and may have originated in basket weaving and the related reed-mat plaiting. The original motifs were natural to both materials and techniques. 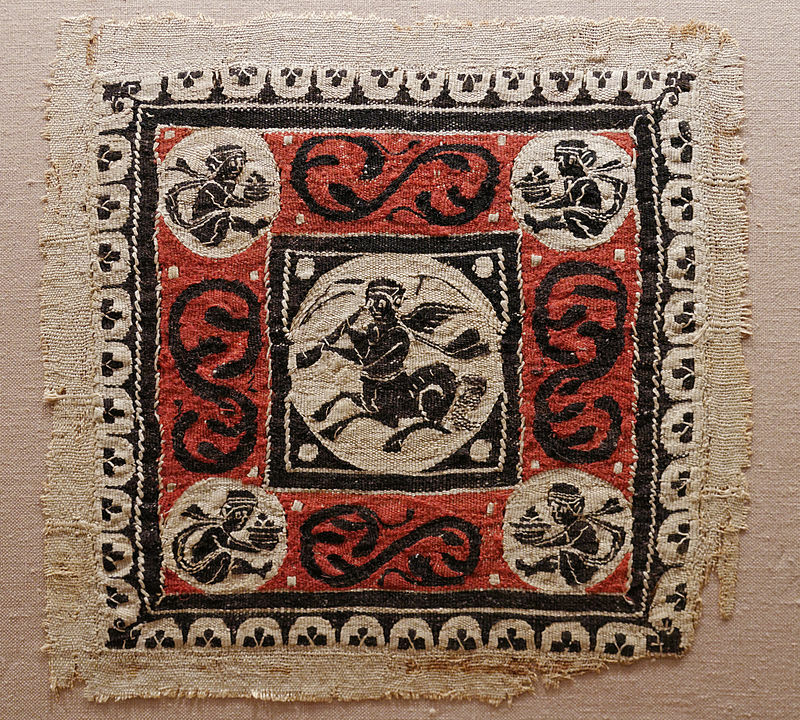 In textiles these motifs have survived in the work of Central Asia, Asia Minor, and the Caucasus, in both, pile-knotted and flat-woven fabrics. The word tapestry derives from old French tapisserie, (from tapisser) meaning ‘to cover with heavy fabric, to carpet’. 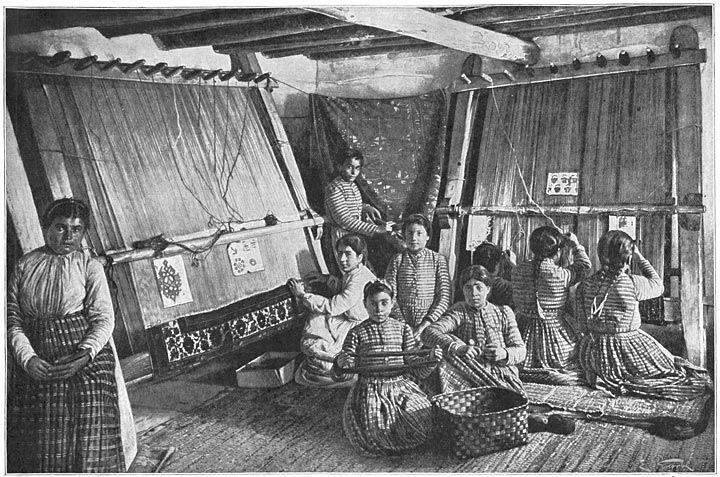 Tapis =heavy fabric, via Latin tapes, from earliest attested form of the word of Mycenaean-Greek origin ta-pe-ja. The term tapestry has also been used to identify any pictorial weaving. Since 18th C, the term tapestry has been narrowed to include only heavy, reversible, patterned or figured handwoven textiles. Early tapestries were colour and textured-based materials. A variety of materials for this purpose were incorporated during weaving or after weaving. Later tapestries were patterned with whole or repeat designs or contained full compositions of scenery, abstract or mythic incidents or episodes. Tapestry weaving began to replicate art work of famous painters, through the use of cartoons. Same paintings were reproduced several times, though the border of a cartoon copied design tended to be restyled every time it was commissioned, This satisfied individual patrons’ personal preference for ornamental motifs. Borders were frequently designed by an artist different from the one who conceived the cartoon for the central narrative or principal image. 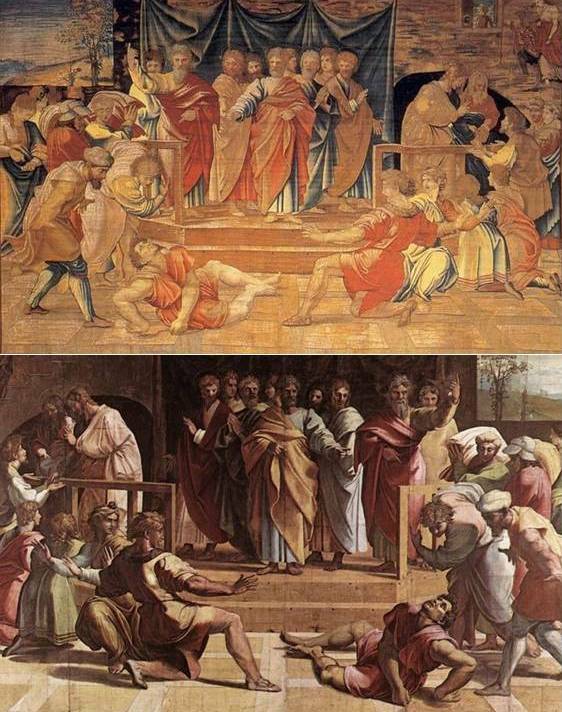 Raphael, The Death of Ananias (1515) as painting, and the same created on tapestry by using the Cartoon. Tapestry is a technique that differs from other forms of weaving in having a weft yarn not carried continuously to the full width of the fabric. The construction of a tapestry weave is such that the wefts are more than the warps, and which are not visible in the finished material. Small length weft yarns of different types, colours and textures are used to produce patterns. The warps in a finished tapestry appear only as almost marked parallel ridges in the texture, or grain of the fabric, according to their coarseness or fineness. By the late 15th century, tapestries had become status symbols among the aristocracies. Tapestries were considered precious possessions. Kings and noblemen carried the rolled up tapestries from one place to another. 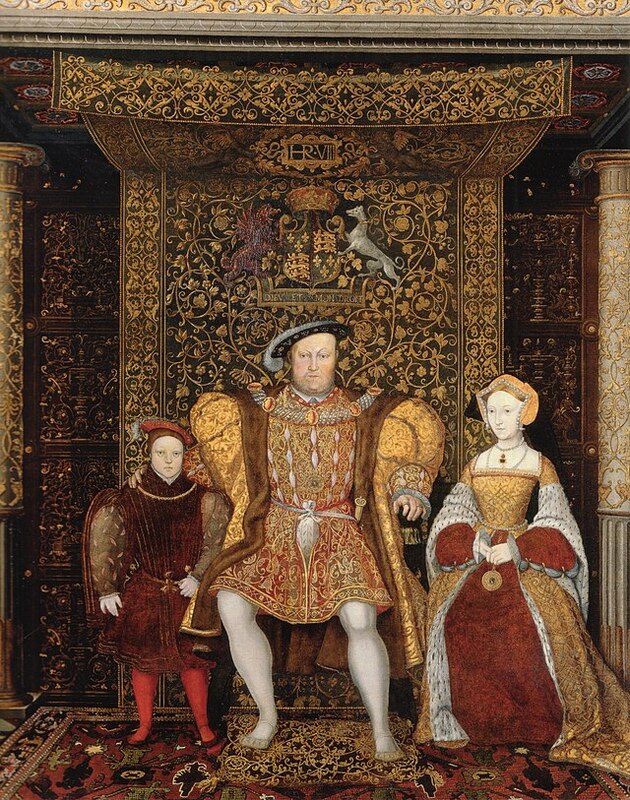 In the Middle Ages, Henry VIII reportedly had 2,000 tapestries in 17 royal residences. The tapestries formed a lively colourful decoration over drab walls of castles and insulated their chilly stone castles. European monasteries and convents became centres of tapestry weaving. In churches, the tapestries with topical themes were displayed on special occasions. In India Vaishnava temples the tapestries are called Pat or Bhitti-Pat (wall -hangings) and form seasonal background for the deity. In Jainism Bhitti-Pat of important religious places are displayed for those who cannot go on pilgrimage. Both of these wall hangings were not woven fabrics but rather embroidered work adorned with glass, precious stones, etc. Le Corbusier once called tapestries ‘nomadic murals’. ‘The destiny of the tapestry of today emerges: it becomes the mural of the modern age’ Corbusier made at least 27 tapestry drawings, known as cartoons, from 1936 to 1965. Beginning in 1949, Corbusier began collaborating with a colleague, Pierre Baudouin, to translate his paintings and drawings into tapestries at the Pinton workshops in Felletin, France. In 1961 Corbusier also collaborated with the weavers of Firminy, near Lyon, to have 765 square yards of tapestry made for the Palace of Justice (High Court) in Chandigarh, India. Many 20th-century architects and artists, including Picasso, Matisse and Braque, liked having their designs translated into woven wool tapestries, and Miró‘s 35-foot-wide 1974 tapestry hung in the World Trade Centre until its destruction. Thanks for the comments and appreciation. I am now retired from design practice at 72. I have always practiced pure design (for 50 years), that is without taking up contracts for execution, supply or trading I have been visiting Design faculty for 27 years.